Peace is marred by the Black Knight. Use the Magic Scrolls to discover a forgotten royal lineage. 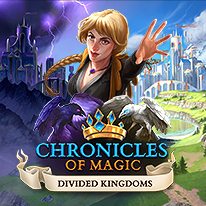 - Visit 30 enchanted locations from both kingdoms! - Discover the spell sequences hidden in Magic Scrolls! - Solve 33 fascinating Minigames and magical sequences! - Collect 46 uncommon Chess Figures and Crow Statues! - Delve into 17 marvellous Hidden Object Puzzles!